Quaid-e-Inqilab has issued the order on 16th Jan 2003 to change my duties. Now I am the Director of Minhaj Internet Bureau. I have served as In charge Computer Affairs of Farid-e-Millat Research Institute. I have served as Research Scholar in Farid-e-Millat Research Institute for 7 years (1996 to 2003). I have been elected the Secretary of foreign affairs of the Minhajians Executive on 2nd Oct. for the session 2001-2002. I have been the Secretary Finance of the Minhajians Executive in session 1999-2000. I have been the Secretary Press of the Minhajians Executive in session 1998-1999. I have been serving for Minhaj Welfare Society in the hide collection for 11 years at every Eid-ul-Adha. I have taught in Minhaj Model School, Gulfishan Colony, Faisalabad, as a field work for 5 months in 1995. I have found out the correct direction of Qibla (Prayer Niche) at new campus of the Minhaj University in early 1991. I have been served as the executive member of the student's union, "Bazm-e-Minhaj", in 1991-92. 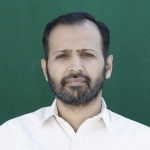 I have served as the Research Assistant in Farid-e-Millat Research Institute for about two years in 1995-96. Bronze Medal for 3rd position in masters in Islamic Studies & Arabic from The Minhaj University in the session 1996. Books Prize for find out the correct direction of Qibla (Prayer Niche) at new campus of the Minhaj University in early 1991. Cup & Books Prize for best arrangements of Annual Seminars' Week of Bazm-e-Minhaj in 1995. Shield of Performance on 24th Oct. 2002 from Quaid-e-Inqilab for the services of web-development for www.Minhajians.org, www.Minhaj.info & www.MinhajBooks.com. Shield of Performance on 2nd Oct. 2001 from Quaid-e-Inqilab for the designing of the Minhajians' website www.Minhajians.org. Certificate of Performance for hide collection at Eid-ul-Adha. Rs.10,000 cash prize from Quaid-e-Inqilab for qualitative editing of the Manifesto of Pakistan Awami Tehreek. Rs.6,500 cash prize from Quaid-e-Inqilab for qualitative editing of the Urdu book Tafseer Sura-e-Fateha & As-Saif-ul-Jali. Rs.25,000 cash prize from Quaid-e-Inqilab for the qualitative designing of the Minhajians' website www.Minhajians.org in my personal capacity. Rs.1,000 cash prize from Quaid-e-Inqilab for qualitative editing of the Urdu book Masala-e-Istighathah (Beseeching the help).